Rep. Mel Watt (D-N.C.), Ranking Member of the Subcommittee on Intellectual Property, Competition, and the Internet. Rep. Sue Myrick (R-N.C.), the first Republican woman to represent North Carolina in Congress. A letter that tends to support Motorola -- except for a limitation I'll address in a second -- asks the ITC to decide "in favor of vigorous patent protection". It was signed by ten Members of Congress from Motorola's home state of Illinois. The letter bears their signatures but doesn't state the names of the signatories in print. I compared the signatures to a list of Representatives from the state of Illinois, and it appears that the signatories include Peter Roskam (R), Danny Davis (D), Mark Kirk (R), Donald Manzullo (R), Bobby Rush (D), Randy Hultgren (R), Joe Walsh (R), Bob Dold (R), and John Shimkus (R), plus one person whose signature I couldn't match to any particular name. That letter signed by a few politicians from its home state is the only statement supporting Motorola in the public interest debate over the import bans it seeks, while Microsoft received, prior to the letters from the politicians listed further above, support from many major companies, including some of its fiercest competitors. Motorola is not supported by any company or industry association, nor by any politician from outside of its home state -- despite the fact that Google outspends Microsoft on lobbying in Washington DC. But even the letter from those Illinois politicians (full text further below) could be interpreted by the ITC as providing justification for denying Motorola's request for an import ban. It makes reference to "reasonable" compensation of right holders, even twice, but the ITC's own Administrative Law Judge David Shaw concluded from the evidence that Motorola's demands were anything but reasonable. The following sections contain the full text of those letters. The jurisdiction of the Judiciary Committee of the U.S. House of Representatives extends to intellectual property policy, competition policy, and issues at their intersection. We write to highlight the public interest implications of the referenced case pending before the Commission concerning the availability of the exclusion order as a remedy in cases in which "standard-essential patents" (SEPs) are asserted. As you know, companies participating in the standards setting process frequently contribute patented technology to the standardization process. SEPs are those patents that are necessarily infringed when the standard is implemented. To enable and promote the broad adoption of the standards, companies contributing their technology to the standard commit to license those patents to all parties implementing the standard on reasonable and non-discriminatory (RAND) terms. A party making a RAND commitment for SEPs promises not to deny a license to anyone who implements the standard. Patent owners agree that they will seek reasonable royalties and not pursue a court order or an exclusion order to prevent the importation or sale of an implementer's product. The aims underlying RAND arrangements may be undermined when a patent owner either petitions the Commission for an exclusion order or makes an unreasonable royalty demand. Businesses and consumers depend on a well-functioning standards setting process to promote interoperability and consumer choice. Industry standards underpin the Internet, cellular networks, and a host of popular devices. Without standards, consumers would not be able to play videos on a website, connect wirelessly to the Internet, watch a DVD, or text, chat, or email one another. Standards are core to the interoperability that drives the Internet and the devices that connect to it. In our view, a failure to honor a RAND commitment undermines confidence in the standards system and disrupts competition and innovation. If companies refuse to comply with their RAND commitments and instead treat their SEPs as a weapon to block others from distributing products that implement key standards, they will prevent and inhibit innovation and competition. Ultimately, this behavior threatens to disrupt competition and undermines the creation and adoption of standards that are at the heart of modern communications technologies and the digital networks that are critical to the global economy. Technological innovation, predictable and stable commerce, and strong competition may be harmed by inappropriate assertions of SEP rights through exclusion orders. Industry standards have been recognized as vital to the development and interoperability of modern technologies throughout the technology and communications sectors. If patent holders are able to renege on their RAND commitments and seek exclusion orders, companies may be more cautious about implementing and developing international standards and interoperability protocols. Actions aimed at preventing the sale of products that rely on industry standards threaten to raise the cost and reduce the availability of popular electronics products such as mobile phones, Blu-ray players, wireless routers, video game consoles, Internet-connected televisions, and computers, among others -- all of which are built upon standards that ensure interoperability. Left unchecked, the ability to leverage SEPs to obtain an exclusion order may result either in these products being excluded from markets altogether or in companies paying unreasonable royalty rates to prevent an exclusion. The adverse consequences may ultimately be passed along to consumers in the form of significantly higher prices. We hope you will consider these concerns as you review this matter. Thank you for your time and attention. I am writing to express my concerns in connection with a pending investigation before the International Trade Commission involving Motorola Mobility Incorporated (MMI) and the Microsoft Corporation. Specifically it is my understanding that MMI is seeking a limited exclusion order against the Xbox 360 for the violation of certain patents pertaining to video transmission and compression (H.264) and wireless connectivity (802.11) on the home videogame console. For the reasons discussed below, I believe that the public interest weighs strongly against the issuance of an exclusion order in this investigation, and I urge you to consider these points carefully. An exclusion order in this matter is an inappropriate remedy where both parties to the investigation are U.S. based companies. As I have stated in the past, I do not believe it is appropriate for the ITC to issue an exclusion order where both the claimant and respondent companies are American-based, and the ultimate goal of the moving party is to obtain monetary damages and not actual injunctive relief against the respondent. If MMI, as a U.S. based company, were a home videogame console manufacturer, then it would be reasonable for the Commission to consider injunctive relief for alleged infringement. However, MMI is not currently a home videogame console manufacturer, and any harm that they may have suffered can likely be remedied through monetary damages rather than excluding Microsoft from importing the Xbox 360 into the U.S. If the ITC were in a position to apply the eBay Inc. v. MercExchange, L.L.C. four-part test that is currently used in federal court, it is my belief that the Commission would be much less likely to award injunctive relief as a remedy in this matter. It is my understanding that this dispute was originally based upon a failure of Microsoft and MMI to agree on new licensing fees for certain MMI patents related to the H.264 video standard. In this instance, it would be in the public's interest if the Commission refrained from issuing an exclusion order and instead allowed the claimant to continue seeking monetary relief through federal courts. An exclusion order would eliminate the only U.S. based videogame console from a market. It is my understanding that §337 of the Tariff Act of 1930 (19 U.S.C. 1337), as amended, prohibits unfair methods of competition or other unfair acts in the importation of products into the United States. Additionally, under the statute, the import or sale of the allegedly infringing product is illegal only if a U.S. industry is producing an article covered by the relevant intellectual property right exists or is in the process of being established. In this instance the allegedly infringing product is the Microsoft Xbox 360. The Xbox 360 console is the only major videogame console that is produced by a U.S.-based company. The two other major home videogame console manufacturers, Nintendo Co. LTD and the Sony Corporation, are both based in Japan. 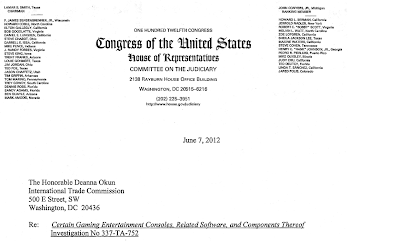 Issuing an exclusion order against the Xbox 360 console would go against the intent of §337 by harming the only U.S. console manufacturer. While the physical console itself is manufactured overseas, Microsoft's Interactive Entertainment Business (which designed and creates software for the Xbox 360) employs thousands of people in the United States. Additionally, the claimant in this matter is not in the home videogame console market and has thus far stated no intent to enter into this market. An exclusion order based on alleged infringement of Standard Essential Patents creates a dangerous precedent that can harm innovation and the American economy. A standard essential patent (SEP) is a patent that discloses and claims one or more inventions that are required in order to practice a given industry standard. In return for disclosing these patents, the owners may receive compensation in the form of licensing fees or in some instances a reasonable royalty. 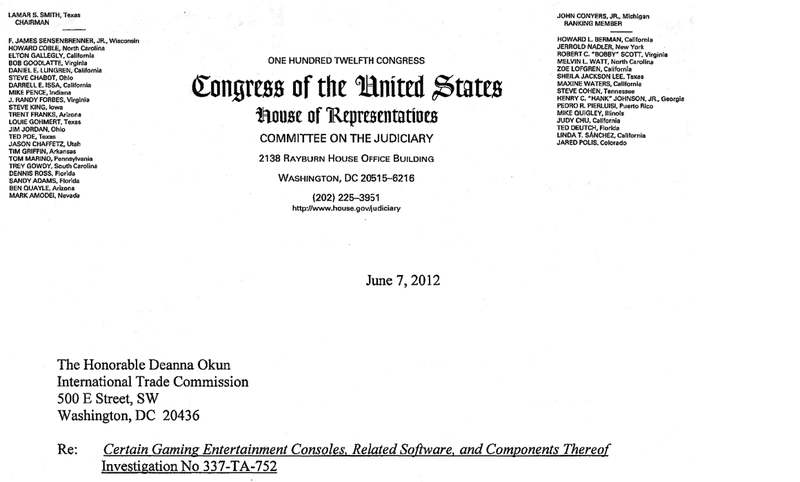 In the matter of SEPs related to this pending investigation, it is my understanding that multiple standard setting bodies were involved in creating the H.264 video standard, including the International Telecommunications Union's Standardization Bureau, the International Organization for Standardization, the International Electrotechnical Commission (IEC) and the Moving Pictures Experts Group. It would be very concerning for the Commission to issue an exclusion order for a dispute based off of standard essential patents when ultimately the dispute in this matter involves licensing fees rather than unfair competition, or harm resulting from the importation of the Xbox 360 into the U.S. Issuing an exclusion order based off alleged infringement of standard essential patents could lead to the adoption of less standards in the future and would likely create a high degree of paranoia amongst companies that are a part of standard setting bodies. In the future many widely adopted technologies could be excluded from importation into the U.S. if other companies decided to follow suit and seek an exclusion order from the Commission based off infringement claims for SEPs. For these reasons, I urge you to carefully consider the implications of a ruling that would exclude importation of the Xbox 360 into the United States. If you have any questions or comments on this matter, please feel free to contact my Legislative Director, Laurent Crenshaw, at [phone number]. I am writing to express my concern regarding an investigation before the International Trade Commission and the possible issuance of an exclusion order against Microsoft's Xbox 360 console. An exclusion order against the Xbox 360 console threatens high-paying jobs and continued economic growth in the state of North Carolina. The Microsoft Xbox 360 is one of three competing game consoles that form the core of a vibrant U.S. entertainment software industry. The entertainment software industry is a major economic driver, which directly or indirectly employs thousands in the U.S. In North Carolina, the industry accounts for approximately 2,500 jobs and $102,000 in direct and indirect compensation per employee. In my district, which includes Charlotte, Microsoft employs approximately 1,500 individuals. An exclusion order would close the U.S. market to this innovative and highly popular product and directly threaten the jobs that are built around it. An exclusion order banning the importation of Xbox 360 gaming consoles into the U.S. harms not only Microsoft, but a variety of companies involved in manufacturing each game platform. A broad set of companies is invested in each game platform, including game developers, content providers and manufacturers, and all depend heavily on the sale of the Xbox. Retailers also face losing a major retail item in their stores which would have a detrimental impact on sales. Additionally, all of these businesses rely on competition among gaming platforms to grow overall demand for consoles and games so banning the Xbox console would reduce competition as well as opportunities for growth and innovation for companies in this market. An exclusion order would be detrimental to U.S. consumers. Any exclusion of the Xbox would substantially reduce competition and consumer choice and has the potential to lead to higher prices for game consoles and related products. Consumers who have already selected Xbox 360 as their gaming console have typically invested -- often hundreds and even thousands of dollars -- in related games and accessories that are not compatible with the two competing game systems. Consumers who wished to replace, upgrade or purchase a second game console for their homes would not be able to choose a new Xbox 360 and would see their investment destroyed and their choices for replacement limited. Therefore, I resepctfully request that you consider carefully the implications a negative ruling would have on jobs and consumer choice in America as a whole and the Ninth District of North Carolina. We are writing to share our views in connection with a pending investigation before the International Trade Commission regarding Microsoft's innovative Xbox 360 console. For the reasons discussed below, we encourage you to consider the potential harm to the public interest of issuing an exclusion order in this case. An exclusion order against the Xbox 360 console could threaten high-paying American jobs and continued economic growth in Washington and throughout the nation. The Microsoft Xbox 360 is one of three competing game consoles that form the core of the U.S. entertainment software industry. Acording to data released by the Entertainment Software Association in 2010, from 2005-2009, the entertainment software industry in the United States grew at an annual rate of more than 10 percent, while the U.S. economy overall grew at a rate of less than two percent. During the same period, direct employment in the entertainment software industry grew at a rate of 8.6 percent. Currently, computer and video game companies directly and indirectly employ more than 120,000 people in 34 states. In Washington, the industry is a major economic driver, accounting for more than 11,200 jobs and $525 million in direct and indirect compensation in 2009. An exclusion order could close the U.S. market to this innovative and highly popular product and directly threaten the jobs built around it. An exclusion order could destroy third-party investments. An exclusion order banning the importation of Xbox 360 gaming consoles could harm not only Microsoft, but a broad range of companies -- large and small -- that have invested in developing and providing products and services for this platform and whose businesses heavily depend upon Xbox sales. These include game developers and publishers, retailers, and manufactureres of controllers and other accessories. A ban on importation of the Xbox 360 console could limit or eliminate entirely the ability of these companies to offer products and services to new customers in the U.S.
An exclusion order could be detrimental to U.S. consumers. Any exclusion of the Xbox could substantially reduce competition and consumer choice and has the potential to lead to higher prices for game consoles and related products. Consumers who have already selected Xbox 360 as their gaming console have typically invested -- often hundreds and even thousands of dollars -- in related games and accessories that are not compatible with the two competing game systems. Consumers who wished to replace, upgrade, or purchase a second game console for their homes might not be able to choose a new Xbox 360 and could see their investment destroyed and their choices for replacement limited. For these reasons, we urge you to consider carefully the implications of a negative ruling int his matter would have on our economy, consumers, industry and jobs in Washington State and throughout the country. As members of the Illinois delegation, we write to share our views on the resolution of the ITC Investigation No. 337-TA-752. We strongly supoport vigorous intellectual property right protection, including injunctive and exclusionary relief, that appropriates and reasonably rewards past innovation and encourages new development, which has been and must continue to be the foundation of this country's economic success. Indeed, to maintain a level playing field in circumstances in which entities are found to be infringing U.S. intellectual property rights but will not provide reasonable compensation to the owner and developer of these rirhgts, injunctive and exclusionary relief must be available and rigorously enforced. Denying legitimate patent protection adversely affects domestic commerce and business in a very meaningful way by preventing domestic companies from protecting their innovations, and thus discouraging domestic companies from investing in future innovation. We urge the Commission to consider fully the important policy issues at stake in this investigation and believe that the public interest weighs in favor of vigorous patent protection.